MOSCOW, Russia -- Heavy fighting flared between Russian-backed rebels and government forces in eastern Ukraine on Wednesday, a day after the first face-to-face meeting between the Russian and Ukrainian presidents bore scant signs of progress. 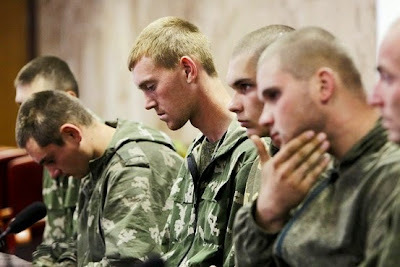 A group of Russian soldiers, shown in Kiev on Wednesday. Ukrainian authorities said they were captured in Ukrainian territory. Western diplomats say that despite Russian President Vladimir Putin's conciliatory remarks in the Belarussian capital of Minsk, events on the ground signal the Kremlin is far from ready to abandon its efforts to coerce Ukraine to turn away from Europe. Western officials have also reacted with increasing sarcasm toward Russian claims it is not backing the rebels with men and weapons. Polish Prime Minister Donald Tusk told his parliament Wednesday that the North Atlantic Treaty Organization has evidence that Russian army units are operating directly in eastern Ukraine. "Nobody can seriously accept talk of 'separatists' in Ukraine anymore," Mr. Tusk said. "The information is from NATO and confirmed by our intelligence, and is basically unambiguous." He didn't elaborate on what the evidence was and took no questions. While leaders attending the talks in Minsk spoke of the need for a cease-fire, Putin kept his remarks focused on trade, and the damage that would be done to Russia's economy if Ukraine were allowed to follow through with an association agreement with the European Union. Putin has called for changes to the agreement. But on Wednesday Ukraine President Petro Poroshenko tweeted it would be submitted for parliamentary approval in September. His foreign minister tweeted that Ukraine wouldn't alter anything. Putin arrived late in Minsk for talks, and after several multilateral meetings with visiting dignitaries from Europe and the former Soviet Union, he held a two-hour meeting with Mr. Poroshenko, who described the session as "very tough and complex." Mr. Poroshenko told reporters afterward that he would devise a cease-fire plan. It remains unclear, however, how he could implement one with most of Ukraine's public strongly supporting a continued fight to regain regions on the country's eastern border with Russia. Vasyl Filipchuk, a former senior Ukrainian foreign ministry official, said taking part in high-level talks on the association agreement was a risky move for Mr. Poroshenko. Putin's attempt to insert Russia into those discussions looked like a way to interfere with Ukraine's foreign policy, Mr. Filipchuk said. "It is about (Ukraine being) an independent state with its own foreign policy," he said. He said Poroshenko was in a tough position. "At the same time as negotiations, you have the Russian army and tanks entering the country," he said. Mr. Poroshenko is also under pressure from European leaders to continue negotiations. Shortly before talks began in Minsk, Kiev released videotapes of Russian soldiers it said were captured inside its territory—soldiers that Moscow confirmed were part of a military unit that it said got lost while on patrol near the border. Kiev accused Russia of sending a column of 100 vehicles into Ukraine to aid an attack toward the southern port city of Mariupol before the talks in Minsk. The push was halted, officials said, near the Ukrainian town of Novoazovsk, but seven villages near the town were captured. On Wednesday, a Ukrainian military spokesman said that Russian artillery and rocket launchers continued to pound the town from Russian territory. While the town remains under Ukrainian control, he said that 13 Ukrainian troops were killed in the past day, and 36 were wounded.